Under extensive or drought conditions it is a known fact that feed supplementation positively influences most production characteristics. 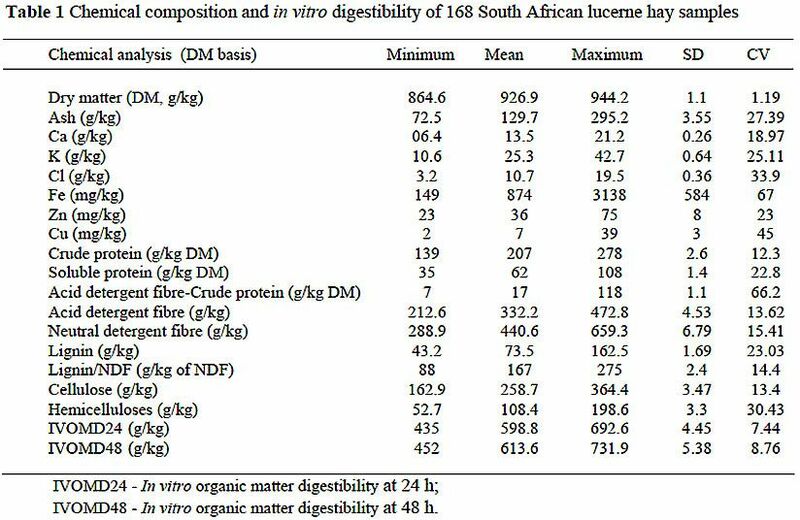 Trials by Loubser recorded significant increases in body mass of Angora ewes grazing mixed Karoo veld supplemented with chocolate maize compared to a control group receiving no supplementation. Lucern hay is used extensively by Mohair farmers under intensive conditions, as a supplementary feed during times of poorer veld quality, during pregnant ewe management and supplementation as well as kids between weaning and 18 months of age. Is lucerne hay on its own sufficient when feeding pregnant and lactating ewes? What level of additional energy supplementation is required when feeding pregnant and lactating ewes ad lib lucerne? 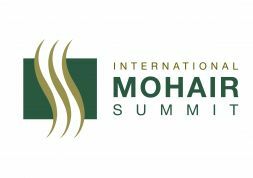 What is the effect on mohair production feeding ad lib lucern with or without additional energy? To answer these questions we can look at trials (King, Sumner, Wentzel, Schlebush and Herselmanis) to establish the optimal level of energy supplementation required for reproducing ewes receiving lucerne hay ad lib. Production achieved by lucern hay under intensive farming systems. 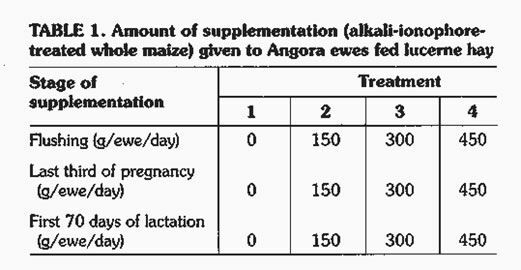 4 different feeding treatments where applied to different stages of the reproductive cycle. 3 stages of the ewe reproductive cycle were evaluated. How would the different levels of feed effect the body mass of the ewes? From Table 2 it is evident that none of the treatment levels had any effect on body mass at any stage of the experiment. This result was contrary to what was expected. (a) What effect would the different feeding levels have on the mohair of the ewes? (b) What effect would the different feeding levels have on the mohair of the kids of these ewes? The rate of supplementation had no significant effect on any of the mohair traits measured. Compared to the national flock producing 4,2 kg mohair per adult goat per year, the ewes in this study produced 5,2 kg/ewe/year, which represents a 23,8 % higher production. The average fibre diameter of 38,4 microns for the first clip and 37,7 microns for the second clip is at the upper limit of the range for adult mohair (34 to 38 microns). This is further proof of the high level of production maintained by the Angora goats fed lucerne hay and is probably the reason for no effect of supplementation on mohair production. It thus seems that the lucerne fed in this experiment supplied sufficient nutrients to the ewes during periods of higher demand. What effect would the different feeding levels have on the reproductive performance of the ewes? The reproductive performance of the experimental animals (Table 5) also suggests that Angora goats could satisfy their energy requirements during all stages of the reproductive cycle when fed lucerne hay. 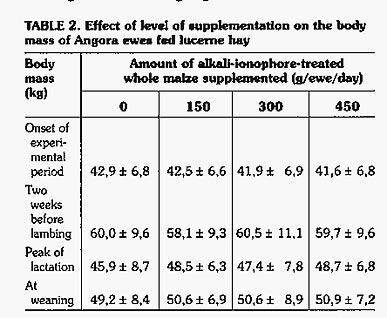 The precise reason for the results obtained in this study, namely that energy supplementation does not increase the reproduction rate of the ewes or the production of mohair by the ewes and kids, is not explicable from the results of this experiment because the intake of lucerne hay was not determined. In the study the energy supplementation may have decreased the intake of lucerne hay, which would explain the fact that no differences occurred between treatment groups. It is furthermore possible that the lower reproduction rate of the treatment groups was the result of a nutrient imbalance caused by a lower intake of lucerne hay and a higher intake of the supplementation? The feed value of Lucerne hay is demonstrated in work by Herselman and Smith who demonstrated the practical importance of energy requirements in non-grazing systems such as feeding schemes in kraals to overcome serious droughts. Under such conditions a maintenance ration is usually fed just to keep animals alive. 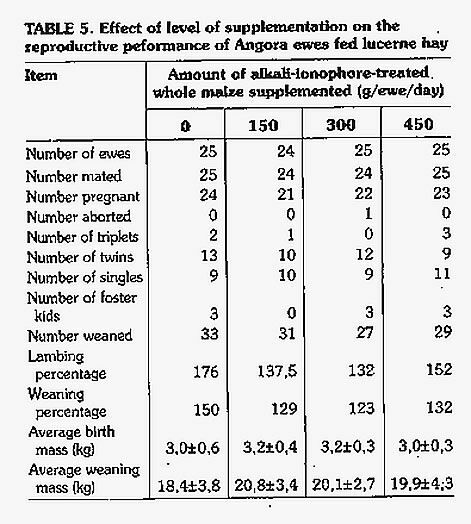 The maintenance requirements of Angora goats at different live weights and equating to mass of Lucerne hay.